Capital High School junior Lizzy Miles lined up for her usual approach. She paused, and released her ball as it rumbled down the lane for a strike. Her faced beamed a joyful smile. Chants and cheers echoed from both teams and she was given a high five from Shelton High School head coach Dann Gagnon. Sometimes the journey is just as rewarding as winning when you reframe your source of joy and value. Shelton defeated Capital 5-0 at West Side Lanes in Olympia, January 10, 2019 to keep them atop the league (13-2 overall, 11-2, SCA 3A) heading into the January 18 league tournament. But smiles and high fives told the true story of the competition. With the win, Shelton’s team has positioned itself to finish strong as it approaches Districts, January 26 at Pacific Lanes. Shelton’s Kaylee Slone has the third highest game average in the SSC 3A at 173.5 pins per game heading toward Districts. She is supported by teammate Dreann Merriman (163.2 game average). Capital hopes to have strong individual performances moving into its post season. Miranda Smith (165.8 game average) and Lizzy Miles (154.2 game average) lead the Cougs. Michael Deakins, coach of Capital, values three core goals for his team. “We want to have fun, get better, and be nice,” he says. Capital (9-7 overall, 6-7, SCA 3A) have not had as strong of a season on the scoreboard as they hoped, but they have won in other areas as a team. 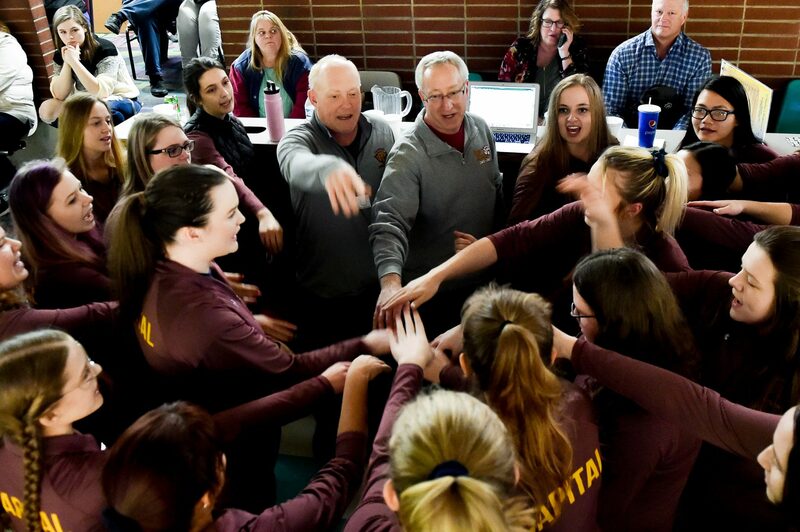 “We have 27 girls on our team and we try to coach our bowlers to see bowling as a game that they can enjoy and teach others to enjoy for the rest of their lives,” Deakins adds. With these goals, sometimes you lose, but you always win.